Autumn has appeared around here (although it sometimes feels like we skipped autumn and went straight to winter), time to huddle in front of a roaring fire playing games! This has been a quiet month for new games with the children, unusually I've learned far more new games than them! 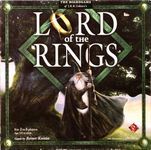 However, we did get out this old Co-op game with Matthew, knowing his fondness for all things Tolkien. Not having played for some time we did rather badly and Sauron corrupted the ringbearer somewhere in Rohan. Still, we had fun, with some impromptu roleplaying included. With Rebecca there were no new games, but she did request this several times. It's a nice 2 player game, though you have to swap sides and play twice to be fair. As it only takes about 10 minutes each way, that works out fine anyway. Some great games for our family. Also: My daughter beat me at The Castles of Burgundy for the first time ever this month. 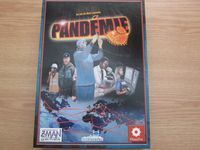 Only one new game for my kids this month, but it was a big hit as they requested to play it a number of times. I got Dungeon Roll mainly because I expected my kids to like this, so I'm happy they do. 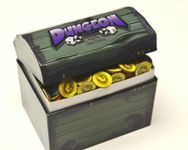 The dice-rolling is exciting of course, and the dungeon crawling theme appeals to them. Also, not a new game (we've played this once or twice before), but an unexpected hit last month was Europa Tour. My oldest son had a geography exam where he had to learn (most of) the European countries and their position on the map, so I suggested we'd play this game so he could look at a map of Europe while doing something fun. He liked the game enough to still request it, even though the exam is already done (he scored 9.5 (out of 10) by the way). I managed to introduce this to my daughter Sharlene (15 yrs old) and my son Shawn (10 yrs old) and it was received quite well. This game has been the surprise of the month and has been well received by the people I've taught to so far. Miska is 5 years old. he got Zoowaboo for his birthday. He enjoyed it and we have played it a few times since. I'm not sure it's his favorite game right bow but it's enough that he enjoys it as it's an interesting game that helps to develop a few skills including extimation, spatial thinking and some social skills (as sometimes you have to solve the task of fitting the animals in a raft as a team). to him and we played it twice. 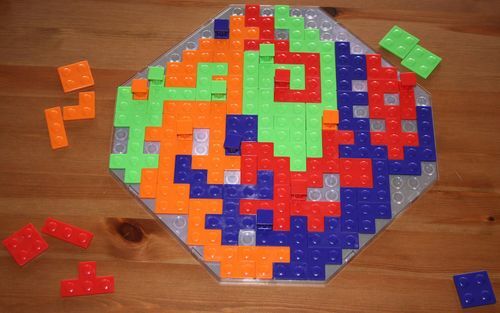 Playing a Blokus-like game (well, So you say it’s Knizia's Blokus clone?) was very interesting for him, and although he had no chance to win (I didn't want to make only sub-optimal moves as even he knew that he is a bit too young for this) he rather enjoyed it and was ready to learn some tactics and strategies. I’m a fan of Wolfgang Kramer. But this so-called ‘children’s version’ of 6 nimmt! is a sad misfire. It is a game for age 5+ but it offers zero strategy or tactics; it’s like Hisss with slightly more complex placement rules and no influence on the results. As even games for 4+-year-olds offer some decisions this card game felt very weak and unnecessary. Even my 5-year-old was a bit bored. My son is 7 and we played Zombicide over the summer. He was playing with me and my buddy and was really proud that he can play the game with 2 adults. So while we waited for the expansions I got a copy of this game here and found it a good way to introduce my son to some tactical gaming (before I put him in front of the ASL SK). And he really learns fast and gets an itch for these kind of games - finding out the weakness of your team and using it to its best for getting the tactical advantage and winning the game. It is not about the strength of a team but mastering its weaknesses, I told him. 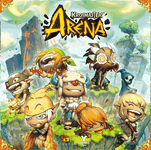 Very funny game with cute figures. I bought two expansions for some variety but I think thats it. Definitely not following the path and collect "all of them". Also played a lot of Legendary: Marvel plus the expansion Dark City. He always beats me at this game and I am amazed how he builds his deck and really uses it to the best possibilities. Have played about 40 times with him and no win for me. Man, I get old. A big hit with our kids and my wife. Very fun game for the family. 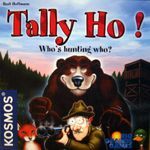 I played this game 3 times with my kids (ages 5, 8 and 10) and they all liked it. I found this game works better than Fauna with kids this age. It's less involved than a game like Fauna, just ordering the animals according to size, weight or lifespan but that's a big part part of why it works so well. I liked it too as I found I was just about as good as my kids at ordering things properly. 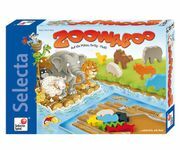 I assume the Timeline games would be better for older kids or adults, but for younger kids, this "Animals" version of the game is great because it's so easy to make a reasonable guess about where the animal belongs. This was the only game new to my older son, 6, this month. I thought he might like the maze element. He was only just old enough to work out what happened as he pushed various rows, but did seem to enjoy it, getting very excited when he reached his cards. Too early yet to say if he'll ask to play again though! 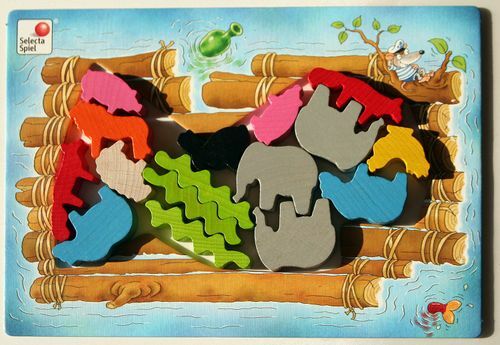 This was my younger son's (aged 3) favourite new to him game this month, with quite a number of plays! He's enjoyed Crazy Chefs for a while, and this is basically the same game with a different theme, that we owned before we were given Crazy Chefs. 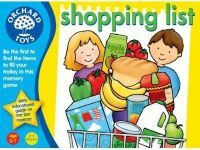 I was quite glad of the variety anyway, although sadly we do seem to have lost the bacon at some point, so we can't play with one of the lists! While I don't think this is the #1 family game it is really fun. This game has hit the table 9 times in 2 weeks, showing up during our weekly family game night for 3 weeks in a row. There are two things that really make this game shine for my family. First is the simultaneous card drafting, there is absolutely no down time in this game. As much as we love playing games like Kingsburg or Stone Age there can be extended periods of downtime while someone is trying to figure out their optimal move. 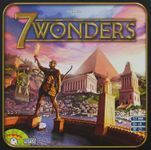 In 7 Wonders everyone is making that choice at the same time and as the amount of cards you have to pick from dwindles the pace of the game picks up. This leads into the second highlight of this game: 1/2 hour game length with 3+ players. This makes it a great game to pull out with Lucien (11) and Madeline (8) on weeknights when we don't have time to play a longer game. 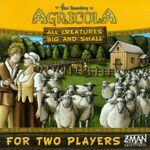 We have some great 2 player games that play in a similar time frame (Agricola All Creatures, Morels and Jaipur) but up till now no really good 3+ player games that fit into that time span. Overall I couldn't be happier with this purchase, my wife and kids love the game. Now I am just trying to decide which expansion to pick up first, Cities or Leaders? 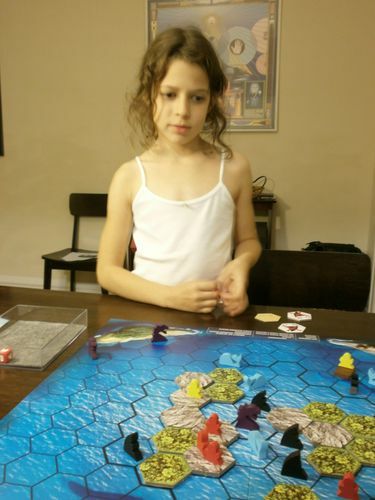 This is now Maia's self-described favorite game (she's almost 10) and her brother Carlos (7) liked it too. The co-op nature helps -- though neither one would be willing to admit it, not having to beat your family members at something makes for a better play experience. Black Box, which is still a bit too challenging for Carlos, and which Maia has shown no interest at all. I'm afraid she's like her dad, uninterested in abstracts but obsessed with storyline. Ring-O Flamingo is a great little game for the young and young at heart. Basically, each player attempted to flip their hoops onto one of the scoring pieces (a flamingo) with points being awarded for how well the hoop goes over the flamingo token. This really engaged the four year old we played it with and I think the all the adults at the table also had a ball. The only downside is searching for rings that ‘overshoot’ after each round. Not a bad game for youngsters who will enjoy both the action and the theme and one I’ll consider for the Little Fish for Christmas. We played a few new in September but this was the stand-out favourite for my son/12 & his best friend/10 .. Both were familiar with the card mechanic which is the same as in Giro Galoppo) so it only took a couple of minutes to explain, and from then on it's been played multiple times per day .. 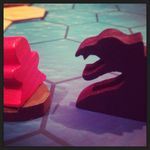 They've even pimped it out with a bigger more impressive shark, and we got the deluxe tin so our men are pirates .. The only thing I take issue with is the rule about the first person of two winning which makes no sense to me, especially when they might only have a body/head left and the second only missing one limb, but perhaps I got that wrong? Either way it's now played till the death in our house! I played seven games of this with my son, using traditional cards. Nothing fancy, but he enjoyed those plays. 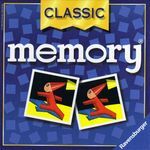 We've played a few memory like games, like The Little Orchard and Chicken Cha Cha Cha, so he's getting familiar with the mechanism. I haven't played this game since I was a child I guess. Also brought Sorry! Sliders out to see if it would work for him. Not sure it does, but we enjoyed flicking the pawns and especially if we could knock other players' pawns out of the way! Rory's Story Cubes: Actions and Rory's Story Cubes: Voyages also got a run out. As I've mentioned, these are hardly boardgames, but rather a fun story telling device. I'll probably bring it out from time to time. I feel like I've been talking about this game a lot lately, sorry if you are hearing this again from me. In September, I finally got 1775: Rebellion to the table. My main "war game" partner is my son (12 yo). He has proclaimed this as his new "favorite game". I really enjoyed it myself. It's pretty simple to learn/teach, but really does have some pretty deep decisions to make as you are trying to control areas, when to play a truce card, when to run from a battle. Good stuff! Played this with my 6 (soon to be 7) year old daughter this weekend. I was really pleasantly surprised about how easy it was for her to pick up. She had no problem with the concept of building fences, or how many animals each area could hold and that the different resources allowed you to buy different things. For the first game though we did not worry too much about the extra buildings, but next game I will certainly spend some time explaining that part to her. Now she is asking more questions about "Big Agricola"
Introduced this to the family and everyone loves it. My daughter (8) asks to play. It's such a short game that it can be played pretty much anytime. I think there is an issue in the three player game...every game we've played, when the start player ends the round he/she scores the most points. Getting one extra animal makes a huge difference. This balances out over three rounds where all players get to be start player, but if you're just playing one round then I think we have to house rule it. I won this in a prize drawing, and it has been quite a success. It is similar to the German classic Tipp-Kick but is more charming and less serious, I guess. Also, the rules are sufficiently unclear to leave room for your own interpretation. Played this with my seven year old, but the three year old has also tried (without standing a chance against us older ones, though). An Amigo novelty that left me cold, but the kids liked it somewhat. It's memory with an extra helping of luck (courtesy of a die). The first test of our new game with our seven year old. She liked it fine, and in the simple version, beat me once. We didn't introduce much new this September with Gabby(our 9 year old), but she really did like this "Gamer Bingo" game. We've played it a couple times and overall we all like it pretty well. 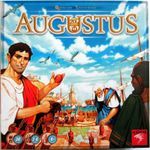 Easy to grasp, enough strategy to make you think a little instead of putting it on cruise control and it is a really nice looking game. One we didn't like though was Primordial Soup, but she did agree to give it another try at a later date, I think maybe we played it at the wrong time. He found the game quite sensible in play, and enjoyed the fact that he could aim for completely different things than I was and still be competitive (he's not so fond of games that force one into a single strategy - with the one that executes it best winning.) And, for my part, I was surprised how functional the game was with 2: it's better with more, I think; but quite viable as a 2p family game. 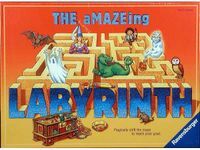 Received this in the Pay it Forward geek list and have played it a few times with my 11 yr old son. We both enjoyed it! Flash Point: Fire Rescue has been the new hit with my 8 yr old son.